With spring almost here, now is a great time to consider cleaning out your house and garage. And why not make a little extra cash doing it? Garage sales are a great way to get rid of unwanted items because 1) they can actually be quite lucrative, 2) the promise of extra cash gives you added incentive to get rid of those superfluous items you’re clinging to, and 3) you can know that your old household items are going to a great home. 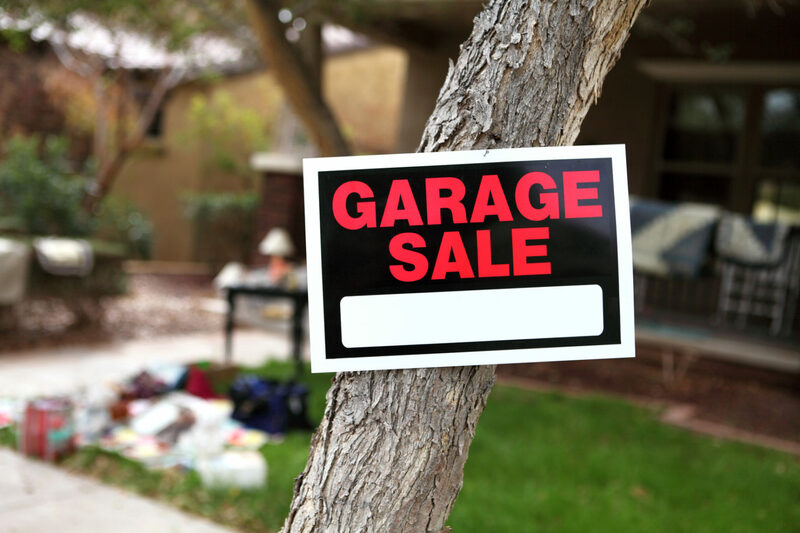 Hold a garage sale can definitely be a strenuous effort, however, so here are some tips to help make sure your next sale is a big success. You’ll first want to make sure that the skies are going to smile upon your garage sale on the date you’re planning it for. Garage sales start populating the neighborhood as soon as the weather starts warming up, so it’s generally a safe bet weather-wise to wait until the start of spring to hold one. And date- and time-wise, Saturday mornings are definitely a popular time for garage sales, so try holding one starting at, say, 8 am and going until around 1 pm. Consider holding a garage sale with other families or relatives. The advantages? You have more help in getting the sale up and running, increased access to supplies like foldable tables and clothing racks, and potentially a better location for the sale if someone you’re teaming up with lives at a high-traffic intersection. As was just stated, having access to a great location is definitely a bonus for a garage sale. This is why teaming up with another family or friend is a great idea. But even if your garage sale does end up showcasing only your household’s items, if you happen to live somewhere that will be hard for potential customers to get to, consider asking a friend or relative if you can use their space. Put yourself in the buyer’s shoes for this one: Would I feel like I was getting a good deal if I picked this up at a garage sale? Even if it feels like you won’t make as much money by doing so, price everything at extra low prices so that customers won’t be reluctant to buy things on a whim—buying things on a whim is kind of the essence of perusing a garage sale, anyway. Chances are that if it’s going to be too much effort to find out the price of something, a potential customer isn’t going to buy it. Have an easy-to-find price tag on every item; pre-printed price stickers are available for purchase even at dollar stores these days, making this step a breeze. And with that, you have the makings for a successful garage sale. Should you decide you’d like to make your home front more inviting for customers with a new garage door, or perhaps you’d like to put your newly pocketed garage sale earnings toward a treat for your garage, don’t hesitate to give us a call.